Each office and warehouse building is richly finished in a Texas country style with warm tone stucco, stone facade and metal roofing. Click to learn more. All the buildings at Montgomery Summit Business Park are constructed of structural steel and metal. Click to learn more. Each office/executive suite building is 6,000 SF which is divisible into four 1,500 SF suites. Additionally, there are office warehouse/flex buildings that are each 9,600 SF which is divisible into four 2,400 SF spaces. Click to learn more. All interiors have 10 foot ceiling height, 8 foot doors, high speed fiber internet and ADA Restrooms. Click to learn more. 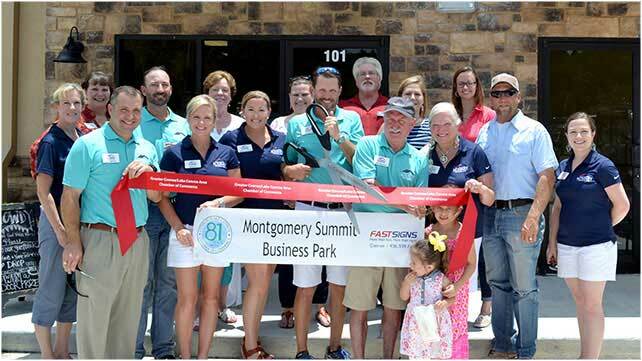 The Montgomery Summit Business Park is located on FM 1097 just north of downtown Montgomery, Texas. The business park includes more than one million square feet of retail, office, office/warehouse flex space and crane ready buildings. With office and office/warehouse configurations available from 1,500 to 40,000 square feet, this business park is well suited for a variety of tenants. Located in one of the oldest towns in Texas, the Montgomery Summit Business Park embodies the charm and energy of the surrounding community. Summit Universal is proud to be a Christian based, family owned and operated company right here in Montgomery, Texas. As active members of the community, we want to see Montgomery thrive in the most positive ways. Montgomery, Texas is widely known for its amazing school district, and in turn, families are moving to our small, but growing town. Montgomery is flourishing and we are choosing to be a positive aspect of this growth. By developing the Montgomery Summit Business Park, we believe it will allow our area to create jobs, enhance the quality of life, and ultimately support our expanding economy. Thank you for the hard work that everyone put into these offices! We are so pleased with the quality of work your team produces and have shared that with many of our friends. We also had our first “real meeting” this afternoon and needless to say they were impressed! Thanks again and be blessed!